A linking-and-learning visit to Saaman, a mining-impacted community in the Fanteakwa District of Ghana’s Eastern Region, afforded SPACES FOR CHANGE / S4C an opportunity to learn about other advocacy approaches resource-rich communities in the West African sub-region are using to push for environmental justice and community participation in natural resource governance. WACAM, the premier community-based human rights and environmental mining advocacy group in Ghana facilitated the visit to Saaman community on September 17, 2018 where S4C met with about 40 community representatives. S4C and WACAM are Ford Foundation grantees. The very presence of mineral resources within developing countries has continued to exacerbate poverty, conflicts and local exclusion from the governance of extractives. The mineral-rich zones were formerly rural farmlands and ancestral villages where indigenous communities depended on for their traditional livelihoods. Host governments parcel out and hand over these farmlands to corporations, especially foreign companies to mine the mineral resources through concession agreements that host communities were neither party to its conception nor execution. In the course of the mining operations, farmlands are polluted, crop yields reduce, green vegetation is destroyed while water sources are contaminated, causing surging discontent among the local populations. Security forces are often invited to quell community agitations for environmental justice, social inclusion and share of resource benefits. This is exactly the situation in Saaman where mining companies have routinely employed force and intimidation to stifle local voices demanding local participation and equitable distribution of mineral resources. Saaman’s community leaders have been arrested and assaulted a number of times, but they refuse to back down. WACAM has been empowering local residents to understand and assert their rights. Apart from Saaman, WACAM has also supported other communities affected by mining to challenge environmental damage in the law courts. Series of dialogue and consultative meetings that WACAM has brokered between government and communities have resulted in local people receiving fair and adequate compensation for the various human rights abuses connected with the activities of multinational and local mining companies. Local leaders told S4C that their water sources have been polluted as a result of mining activities. A unique strategy that has kept the struggle alive is the role of women play in the community struggles for environmental justice. The women attend meetings and partake in both social and political discussions affecting their community. At the meetings, they sing and dance in solidarity with their men, vowing to stand by them in the most difficult times. The women, all dressed in their native white apparels, have led protest marches, chanting and pressing their justice demands to the authorities. The protests were popular with the local press. The empowerment they received from WACAM has emboldened them to ask questions, and challenge corporate impunity. 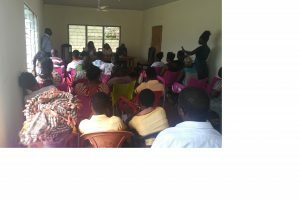 For instance, at the linking-and-sharing visitation held at the primary school in the community, a local woman quoted Article 41K of the Ghanaian constitution, asserting her right to benefit from the gains of natural resources. Through the sharing of knowledge, experience and learning between Nigeria and Ghana communities, S4C hopes to replicate some of the lessons learned from Saaman in its partner communities in Nigeria while communicating key lessons more widely. This sort of learning enables the organization to supplement its capacity-building programmes designed to help community groups and organizations to connect with each other while drawing on a range of good practice materials that are sourced from similarly-situated communities within the continent.